Rose Water from Nielsen-Massey is an elegant steam distillate of rose petals. With multiple uses around the home, in recipes, and as part of a regular beauty regimen, Rose Water is the perfect way to welcome summer’s traditional outdoor fun and opportunities for relaxation. Rose Water is the perfect addition to a fresh berry salad. Toss raspberries, strawberries, and blueberries with a drop of Rose Water to make the berry flavor bloom. Garnish with a sprig of mint or edible flowers. Use Rose Water as a skin refresher. Dab Rose Water on a cotton ball and apply to a freshly-washed face after a long day of working in the garden. The natural astringent properties keep your skin gleaming and youthful. You can also add Rose Water to warm bath water for pampering stress-reliever. Add a dash of Rose Water to your favorite custard recipe, sugar cookie or butter cake for an updated take on your traditional recipes. Add a small amount of Rose Water to the water for your iron to lightly freshen your laundry as you go. The light scent will keep you energized and motivated throughout your day. The recipe for Strawberry Rose Water Mojitos from Nielsen-Massey Vanillas, below, is the ideal drink for sipping during early summer evenings. 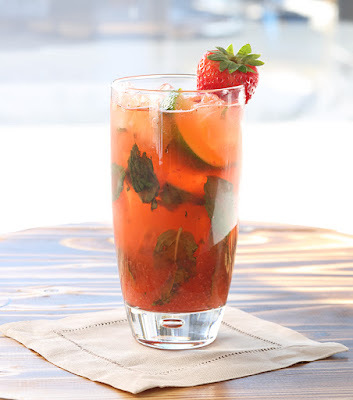 Made with flavorful Rose Water, strawberries and fresh mint, this refreshing beverage is perfect for a party or just to wind down after a day of gardening. Add syrup ingredients to a small food processor and pulse until smooth; set aside. This recipe makes enough syrup for four Strawberry-Rose Mojitos. Yield About 1 Cup. Muddle mint leaves in a tall glass. Add Strawberry-Rose Syrup, white rum, lime juice and lots of ice. Top with club soda and a freshly squeezed lime wedge; stir. Serves 1. I have always wanted to try rose water in foods. I did not know that Nielsen-Massey manufactured it and might buy it from the site. The recipe sounds delicious and refreshing.